Mijas Costa is the coastal borough of Mijas Pueblo, almost as a natural extension created by the demand for new property during its boom years. The area known as Mijas Costa borders with Fuengirola and includes numerous settlements or urbanisations such as Las Lagunas, El Faro, La Cala de Mijas, Miraflores, Riviera del Sol and up to Calahonda which is 16km East of Marbella. Combined with that of Mijas Pueblo it is one of the largest areas in Malaga province covering approximately 147 km2. Las Lagunas is located mountain side of the N340 which separates Fuengirola from Mijas Costa; you will find numerous shops, attractions and services within easy access. A little further on is El Faro which is a relatively small community with easy access to the beach; there are some shops, a pharmacy and a couple of restaurants. La Cala de Mijas is the next big location after Fuengirola. La Cala is a modern and comprehensive facilities such as supermarkets, a wide variety of shops, medical centre and a big open market located at the entrance to La Cala just off the N340. 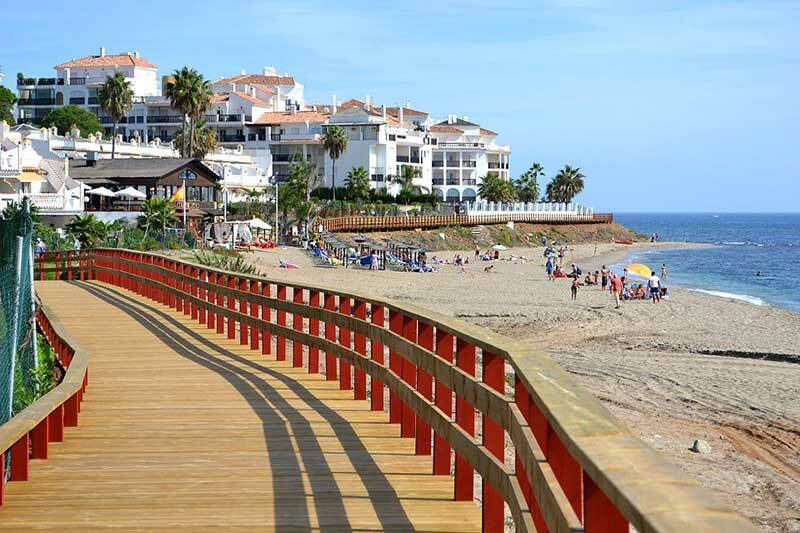 Riviera del Sol and Miraflores are next along the coastline before reaching Calahonda. Both of these urbanisations also have a wide range of services and facilities as well as access to some great beaches. For generations prior to the property boom, these small settlements where just tiny fishing communities until around the 1950’s when tourism discovered the Costa del Sol, these neighbourhoods have since grown and grown as a natural response to the property buying frenzy from the 80’s, 90’s and in 2000. These areas saw an enormous increase in its inhabitants who in the early days put great strain on its infrastructure, roads, shopping facilities, medical care, water consumption, electricity consumption and all those other aspects related to an increase in population. As more and more expatriates settled to life in Mijas Costa, infrastructure grew and grew, many expats took the opportunity to start new ventures such as shops, building services, maintenance services, real estate companies and many other different varieties of enterprises. For those interested in golf on the Costa del Sol, there are some of the best courses in Mijas Costa such as Mijas Golf which is located slightly inland from Fuengirola on the new road to Coin, La Cala resort located on la Cala de Mijas and has THREE golf courses, Miraflores Golf, Santana Golf, La Noria and La Siesta Golf. All these courses are well established and offer a combination of great golf with spectacular views! Myramar shopping centre is located in Mijas Costa on the outskirts of Fuengirola just off the N340, it is the main shopping centre before La Cañada in Marbella. There is plenty of free parking outdoors and indoors as well as a wide variety of shops and restaurants. Mijas Costa is a well-developed area which attracts tourists from all corners of the world as well as those looking for a new life by the Mediterranean Sea.